and have cradled the rear ends of celebrities and presidents. THE LAST TIME I INTERVIEWED SAM MALOOF, an eight-lane freeway was about to run over the home he and his wife, Freda, had built by hand over decades in a Southern California lemon grove. Fourteen years later, Freda has passed away and Maloof, 92, stands hunched in the doorway of a residence the state moved him into after the bulldozers arrived. Don't worry, though. This isn't a sad story. Maloof isn't one to let life go awry for long. Maloof built his first home (above) himself, adding a hand-carved stairway and filling the house with other artists' work. Maloof has just returned from a weekend in the artsy coastal town of Laguna Beach. Dressed in jeans, a sweater that's unraveling at the collar, and thick tortoiseshell glasses, he's eager to talk about the deal a shopkeeper gave him on some Hopi pots and the pleasures of his oceanfront hotel room's two-person Jacuzzi, which he enjoyed with Beverly, his wife of seven years. 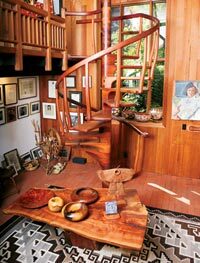 Maloof's original house had grown organically beneath a sprawling avocado tree, a few steps from the shop where he began building hardwood furniture, including his iconic rocking chairs, almost 70 years ago. Since then his furniture has found its way into museums such as the Smithsonian and collections of admirers including former presidents Jimmy Carter, Ronald Reagan, and Bill Clinton. It has also earned Maloof a MacArthur Foundation "genius" award. In the 1990s, as the blare of horns impatiently urging the freeway's completion grew to a figurative din, Maloof calmly negotiated. Ultimately, the state of California declared his house and shop landmarks and moved them, down to the last dovetailed window frame, to another citrus grove a few miles away in the dry foothills of the San Gabriel Mountains. Then, using the self-taught designer's own drawings, the state constructed a new home for Maloof within earshot of the rebuilt original, now a museum. Maloof still rough-shapes every piece of furniture that comes out of his shop, he says. We step into a series of rooms where craftspeople--some of whom have worked for Maloof off and on for as many as 50 years--push walnut through whirring band saws and run sandpaper over fiddleback and bird's-eye maple arms and legs. 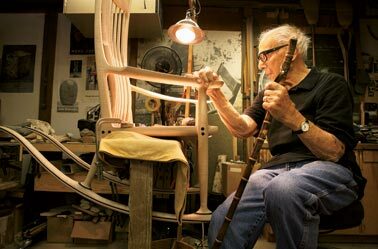 Pausing at one of his trademark rockers, Maloof strokes the flowing lines. He licks the forefinger of his gnarled right hand and wipes away sawdust, studying the moist grain as if he's never before noticed its swirling complexity. "Sit down," he urges, in a voice like the growl of a saintly grizzly. "If it's not comfortable, it doesn't matter if it's beautiful." After lunch with the crew at In-N-Out Burger, Maloof takes care of paperwork, and I wander alone though the old house, quickly getting lost. It's not that big and I've been here before, but it seems to have taken root and continued to spread, its walls of weathered wood and meandering blue sheet-metal rooflines blending into the lush, drought-tolerant landscaping Beverly has taken on as her project. 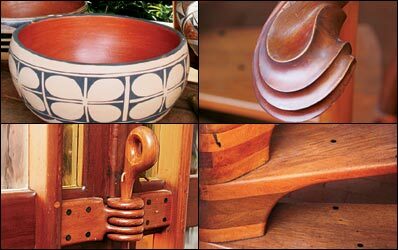 Maloof stamps his homes with artistic detail, adding such idiosyncratic touches as Hopi pots, hand-carved balustrades, ebony-dowelled stair treads, and whimsical door latches. Much of the house is cordoned off now. But each room still seems to thrum with the life force of the people who walked its clackity loose-brick floors and sat talking, reading, or watching TV on its walnut rockers and sculptural ziricote benches. In the kitchen, an old brown refrigerator is still covered with psalms and poems and photos of family--mainly Freda. Tall windows let in summer light, drained of its suffocating heat by the surrounding foliage--a house made green the old-fashioned way, mainly with an open design and surrounding greenery. The paintings and sculptures Maloof has never stopped buying or receiving as gifts from his vast network of friends surprise at every turn, reflecting one craftsman's lifelong celebration of others' creativity and disciplined attention to detail. Back at the new house, where Beverly is spoon-feeding their sick, three-legged retriever, Maloof says he's grateful for all that has happened but not entirely satisfied with compromises made or the contractors' workmanship. So he's been steadily tinkering: Adding hand-shaped 2-by-12s with ebony dowels to exposed posts and replacing a standard staircase (which would have seemed splendid in any of the big tract homes blossoming in the fields and hills nearby) with a hand-carved spiral of steps, reminiscent of the stairway in the old home. Here Maloof has added a room with carved window frames, and there Beverly has arranged delicate orange and ochre plates to catch the afternoon light. Bells from Paolo Solari's experimental Arizona desert town, Arcosanti, tinkle. The dog laps water. I absorb the serenity I've always felt when visiting Maloof. This new home is growing, I think--starting to resonate with its inhabitants, developing what I can only describe as a soul. "American black walnut. The trees are plentiful, especially in neighborhoods in Northern California. They die of old age, and there are woodcutters who know where every tree is." "The state built [the new home] and used Formica in the kitchen. I took it out and put in solid walnut." For more information on Sam Maloof, his furniture, and the arts and crafts movement, visit malooffoundation.org. Photos by Bob Carey; used with permission.